This entry was written by Sarah Jenkins, posted on 04/18/2015 at 11:16 pm, filed under April 2015 category. Today we wake to the majesty of the golden sun as it rises over the Golan and sparkles across the gentle waves of the Sea of Galilee. As we stand on our hotel balconies with a mixture of wind and birds chirping as they greet the dawn, we are struck by the beauty of this place. Our hearts are full of joy to be able to see this for ourselves. We thank God and express our gratitude in private prayers for this wonderful privilege. Mark and Terrie had arranged a private cruise for us today on the Sea of Galilee. After a short walk from our hotel, we boarded a boat for our experience. Before we went too far from port, the captain raised the American flag under the Israeli flag and played our national anthem. Seeing the two flags together reminded us of our close connection to this land and its people. As our boat continued out on the Lake, the captain played praise songs for a time of reflection. Then the captain stopped the boat and Bob read from the Bible (Matthew 8: 23-27) where the disciples ‘experienced’ a storm on this beautiful lake. Who do we turn to in time of crisis? The disciples looked to Jesus, as should we! We are to exalt in the God of our Salvation. We landed at Nof Ginosaur where there is a museum that includes a small boat that was discovered on the banks of the Sea of Galilee – that dates to the time of Christ. We were amazed at how small it is! We take a brief break and spend a little time shopping at the gift shop before moving on to our next destination. We took a short bus ride to St. Peter’s Primacy located in Tabgha on the northwest shore of the Sea of Galilee. It marks Peter’s encounter with the risen Christ as recorded in John 21:1-19. Jesus appeared to his disciples after His resurrection and prepared a breakfast of fish on a charcoal fire (vs 9). The fire is a symbol reminding Peter of the fire where he warmed himself when he denied Christ three times. Jesus shows His three-fold restoration of Peter by asking him three times, “Do you love me?” This is a question we must ask of ourselves. Next we went to Capernaum, Christ’s ministry base in Galilee, a fishing village and home to the sons of Zebedee, James and John, who shared in a fishing business with brothers Simon and Andrew. 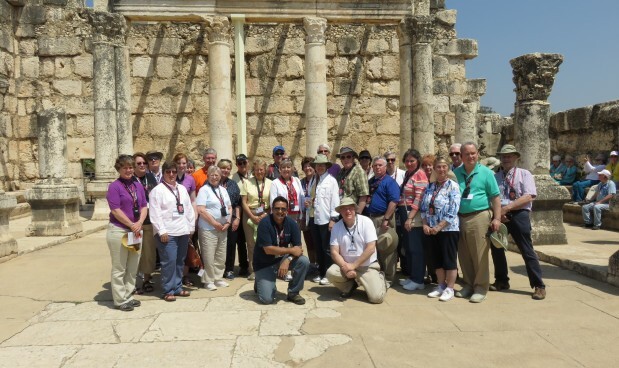 Capernaum was the place of many of the miracles recorded in the gospels and also where Jesus taught in the synagogue as one who had authority and not merely as one who teaches the law given to Moses. As we looked at the ruins – places where our Savior lived and taught, our guide reminded us that we are in an authentic spot – “X marks the spot”. We saw the house of Peter and the ancient synagogue. It’s just amazing to be here! The Pastor led us in a time of reflection on the armour of God from Ephesians 6, reminding us of the ‘weapons’ we have available to us. God’s Spirit lives within us and we can rely upon His might. After Capernaum, we went to Bethsaida, the ‘House of the Fisherman’, where iron hooks, stone sinkers, and other fishing implements have been found. There is evidence of a lagoon nearby where the best fishing would occur. Several of the disciples (Peter, Andrew, and Phillip) called this town their home. Before entering the city through chambered gates, we saw a portion of a road from the first century! Our group wandered through the ruins, including a pagan altar to Baal. Many believe the feeding of the 4,000 occurred nearby but we are certain that Jesus healed a blind man here (Mark 8: 22-26). After Bethsaida, we traveled to Migdala, the home town of Mary Magdalene. We join up with Father Kelly, who manages the site and graciously invited our group to tour them. These impressive excavations are reshaping our thinking about this first century village that was home to Mary Magdalene. This village was a major center for the fishing industry in the region, and is much larger than previously thought – Migdal was a village of some 35,000 people. They had a sophisticated oxidation processes for sardines and other fish, with exports that sent their produce as far as Rome. The recent excavations have helped us pinpoint important events chronicled in the gospels such as the calling of the disciples along the shore, and the encounter with Mary of Migdal who would become a follower of Jesus. We were able to see excavations of a synagogue that has a stone engraved with a seven-branched menorah from the time of the Second Temple in Jerusalem – that’s the time of Christ. More than 3,000 coins have been found at this site – one dated 30 A.D.! We saw restored mosaics, frescos, housing areas, and so much more. A chapel for all Christians has been built and dedicated to all women of the Bible as well as Women of Faith today. There are many plans for this site so we will have to come back!